Isn’t it about time that you had the carpets your home deserved? KIWI Services has been cleaning carpets for 30 years and can give the dingiest carpets a bright and shiny new look. All you have to do is schedule Savannah, Texas carpet cleaning by KIWI, and we’ll take care of the rest! When you schedule a carpet cleaning with KIWI Services, you should always rest assured that your home and you carpets will always be taken care of. KIWI has 30 years of experience and can make the dirtiest carpets look brand new again! KIWI prides itself on being an affordable company, thanks to the KIWI Lover One–Year Carpet Cleaning Warranty. 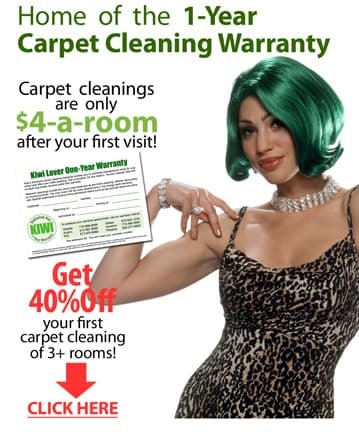 Savannah customers who spend $120 on an initial carpet cleaning will automatically receive the warranty which promises a full year of warranty carpet cleanings for just $4 per room, plus a $37 trip charge. KIWI Services promises to never use a carpet cleaning solution or a carpet cleaning method that is not 100% safe for kids and pets or the environment. that’s why we only use natural ingredients in our carpet cleaning solution so that it’s safe for the whole family. KIWI also only uses the dry carpet cleaning method because it produces no wastewater and dries in about 15–45 minutes. To receive more information about carpet cleaning or to schedule a service, call the Dallas area KIWI Services Center today to speak to one of our representatives!